May the force be with anyone who wants to challenge it on the drag strip. Strange things seem to happen frequently in Michigan. Not as often as they do in Florida, but turn on the tap in certain counties and sometimes lead leaks out instead of water. Other instances include the fact that Michigan houses motor city but is now a center where autonomous technology is being pioneered to render the driver’s seat just another seat in a car. Now, a recent interview by Autoblog claims that designers in Michigan have a thing for adding Hollywood fantasy to their cars, specifically the Mustang. Appropriately published on May 4th, the unofficial Star Wars holiday, Autoblog spoke with Ford design manager, Melvin Betancourt, who said: "When we were designing the new 2018 Mustang, the team wanted to make the new model look more aggressive, and one place where we found inspiration was one of the most famous screenplay villains of all time. The angled nostrils and contours of Darth Vader's mask became the inspiration for the Mustang's new fog lamp scoops and front-end shape.” In a loose comparison, Betancourt’s comments make sense. While Vader’s mask eliminated his human features and makes him look like a scary evil robot, the downward slope of the hood over the Mustang's headlights give an angry face to the car. Anger is emotion, something Darth Vader lacks, though it’s the emotional void delivered by the rest of the 'Stang's contoured lines that deliver the fear of unpredictability. Will it respond with deadly force or just pick out the nearest Cars and Coffee audience on which to take out its anger? Nobody knows for sure. What is clear is that the Mustang’s 2018 facelift will be a hit. The car has already been crowned as the best selling sports car in the world, but with the V6 engine gone and a new ten-speed automatic available, the new face will only serve to add to the experience. 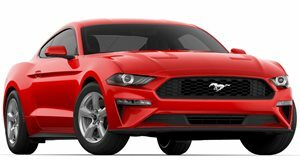 As a pony car, the Mustang’s job is to deliver sports car emotion at passenger car prices, and thanks to V8s and Vader, the 2018 rendition seems that it will do just that.